Boundaries between distinct topological phases of matter support robust, yet exotic quantum states such as spin-momentum locked transport channels or Majorana fermions. The idea of using such states in spintronic devices or as qubits in quantum information technologies is a strong driver of current research in condensed matter physics. We show that, in materials known as graphene nanoribbons, topological electronic states can be precisely engineered and probed, providing an experimental platform for studying electronic topology. This work was carried out by Oliver Gröning & colleagues in the group of Prof. Dr. Roman Fasel, in collaboration with the group of Prof. Dr. Klaus Müllen at the MPI-P Mainz. 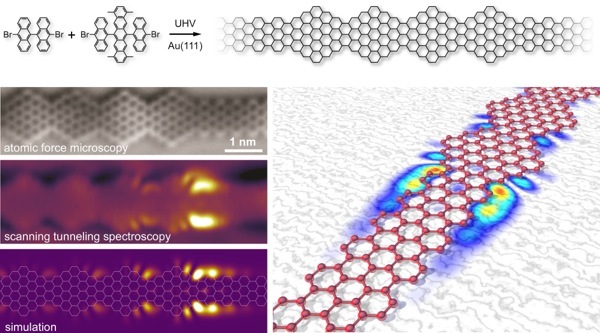 "Engineering of robust topological quantum phases in graphene nanoribbons"
Nature, 2018, 560(7717), 209-213; doi:10.1038/s41586-018-0375-9.